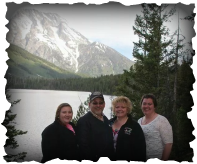 This picture of my family was taken at Jenny Lake in Jackson Hole, Wy. The Teton Mountains are in the background. Are ya'll ready for a rip roarin' year of Kindergarten? Hello! I am Mrs. Harper and I am the Kindergarten teacher at Spoon River Valley Elementary. My husband and I live in rural Maquon. I have two daughters. My oldest daughter lives in Sheridan, Wyoming and teaches Kindergarten. My youngest daughter graduated from Sheridan College and now is finishing her Art degree at Rocky Mountain College of Art and Design. I have two Australian dogs. I love school supplies, the Circle K Kindergarten, antiquing, watching Longmire on Netflix and reading the Boxcar Children to all my new classes! I look forward to the year ahead of us and am excited to share many wonderful adventures with you at the Circle K Kindergarten!